Since 1994 I’ve written about content linking strategies for Ad AgeMagazine, SearchEngineLand, ClickZ, SearchEngineWatch, Web Marketing Today, Search Marketing Standard, MarketingProfs, Webmaster Radio, and many others. I’ve also given presentations, interviews, webinars, videos, and live hangouts. Below are links to as many as I could curate. Many are located off the EricWard.com site, but all are public. 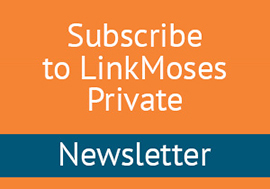 After 20+ years writing for others, I now publish a private Linking Strategies Report/Newsletter called Linkmoses Private which you can learn more about and subscribe to here. You can also learn about my other linking strategy services. – What If Everything You Know About Link Building Is Wrong? – Paid Links from .edu’s – Good, Bad or Ugly? – The Great Link Race Has Begun, But To Where? – After The Basics – Now What? – Social Media Links – Spam 2.0? –What are the best practices for submitting to directories? – What is the meaning of life, and link building? – How do I determine good link targets? – Where Is The Mother of All Links? – Is White Hat Link Building a Myth? – Are You A Link Whore? – How does Google collect and rank results? – What Makes a Web Site Link-Worthy? – Linkability – Why Do Some Sites Have It While Others Don’t? – Aggressively Seeking Links: How Much Is Too Much? – Are Specialists The Future Of Link Building? – Link Building vs. Link Marketing: Whats The Difference? – Are You Link Building Or Just Keeping Up With The Joneses? – Are Shortened URL Links Worth The Trouble? – Twitter: Incredibly Valuable Or Utterly Useless As A Link Building Tool? – Who Owns Link Building? – Is This Link Building RFP A No-Win? – What If It Isnt Linkworthy? – Addicted to Link Research? – Paid Me to Blog: The End of the Blog as We Know It? – Can You Benefit from Reciprocal Links? – Social Link Tic Tacs, Anyone? – Will Reciprocal Links Get You in Trouble? – My SEO Firm Got Me Banned  Now What? – Can New Custom Search Engines Help You?